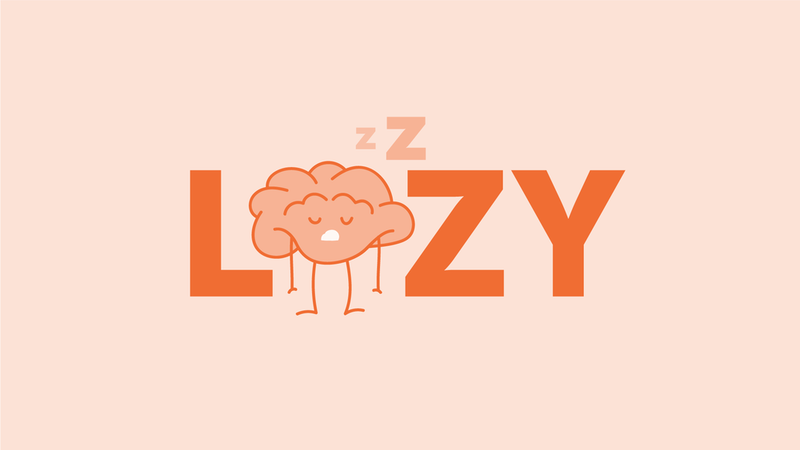 Brains are lazy. It’s not an insult… it's an evolutionary adaptation. We’re designed for efficiency, and when things feel easy, they also tend to feel pretty good. We’re rewarded by feelings of comfort when our minds don’t have to work too hard. Our brains feel a whole lot less comfortable with cognitive effort. So the question is, when a message has some complexity to it and requires more in-depth thinking on our audience’s part, how can we leverage storytelling to break through? Whether we’re working on a marketing campaign, crafting a legal argument, or hiking the ol’ campaign trail, creating “cognitive ease” should be at the forefront of our minds. And below, you’ll find three ways that storytelling can help you elicit that sense of ease, even with complex topics. As behavioral economist Daniel Kahneman explains in his book, Thinking, Fast and Slow, when a message is printed clearly, or has been repeated or primed, or if the reader encounters the message when she is in a good mood, she is more likely to experience cognitive ease. When a person is in this state of cognitive ease, she’ll tend to believe what she hears, trust her subconscious intuitions, and feel like the current situation is comfortable and familiar. She’ll also probably be a bit less skeptical of the message, and take it at face value. So as communicators who care about the outcomes of our messaging, it’s critically important to instill feelings of cognitive ease, as it can help our audience feel a greater sense of trust in what we have to say. Here are three ways to elicit cognitive ease in your audience: visually, verbally, and temporally. If you’re a designer, this first approach is going to sound like a no-brainer. Stick with me though. This gets more and more involved as we go. Both of these statements are false — Hitler was actually born in 1889. But according to Kahneman, experiments have shown that the first statement is more likely to believed, simply because it has higher contrast with the background. In addition to paying attention to color and contrast, make sure to present your message with a clear visual hierarchy, making it easy for your audience to understand where the most important information lives. Take this blog post for example. If it were organized as in Figure 1, you probably would have taken one look and promptly closed the window. But because the post has clear headings, body copy, bolded text, bullet points, and relevant imagery that’s been organized in an intuitive way, you’ve given it enough attention to at least give it a chance. This is relevant whether you’re writing a blog post, creating presentation slides, putting together a scientific report, or writing a cold email. Have a look at the next two images. 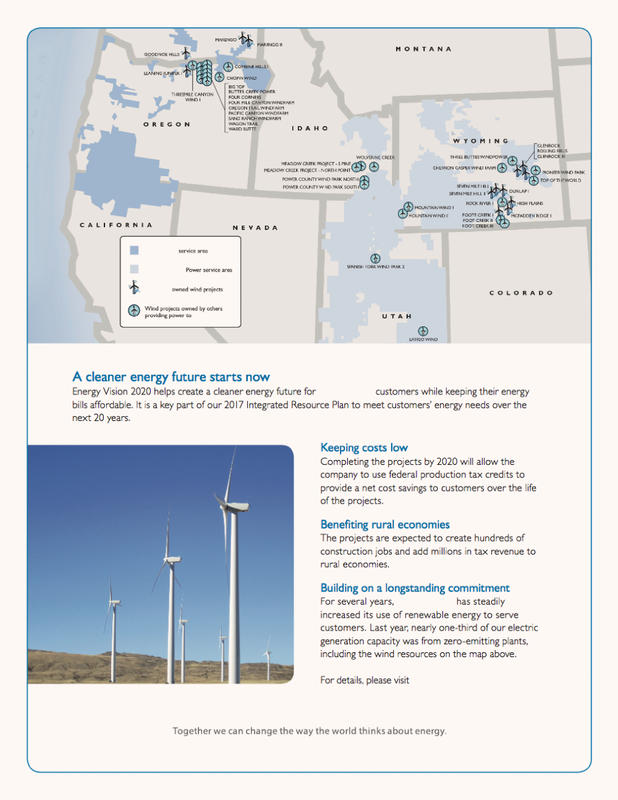 The one on the left, Figure 3, is an externally facing document that explains how my client, an American utility company, thinks about a cleaner energy future. Ok… not bad. I can’t exactly call the design jaw-droppingly creative, but there’s clarity to it. There’s a hierarchy. It’s easy to tell which portions of the page pertain to which specific topic. In general, it’s easy to understand its organization at a glance. Figure 4 — Umm, what’s this now? But then compare it to the image on the right, Figure 4. It’s produced by the same company, just the audience is different. Instead of it being a customer-facing document, this one is for professionals in the field — legislators, attorneys, energy wonks. Click the image to enlarge it so you can see its ridiculousness in all its glory. I’d bet a thousand bucks that even an industry pro couldn’t tell me what the specific differences are between the black dotted line with triangles and the medium grey dotted line with diamonds. Can you even begin to follow the lines? For me, the only thing I can deduce is an overall downward trend. But here’s the thing… it’s not even about being able to read the graph. 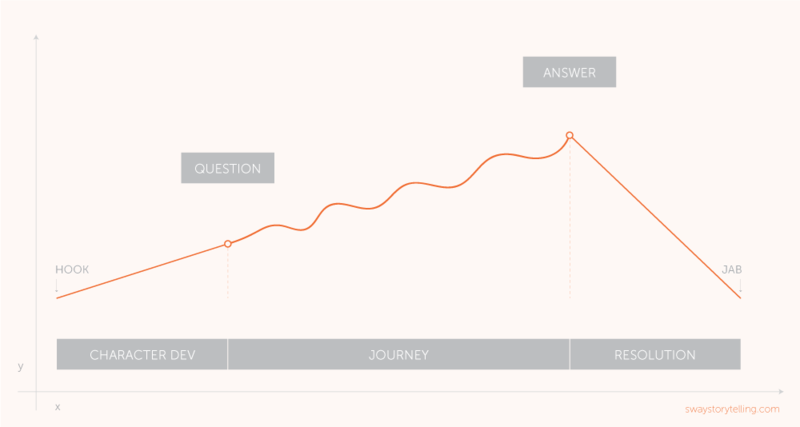 It’s about the reader feeling like the graph is unaccessible. This image causes the opposite of ease, cognitive strain, which tends to promote skepticism, vigilance, and distrust. And if the audience goes into the graph with subconscious feelings of distrust AND can’t actually follow the details of the lines, whatever overall downward trend they perceive may not be trusted. And for this reason, this graph worked against my client’s interests — especially since the audience they were trying to convince was already a bit skeptical of the company from the get-go. Just because a document is “for internal purposes” or “for experts” doesn’t give us license to throw clear communication out the window. Do you remember that 8th grade paper you were writing, when you’d sit there with a thesaurus looking up synonyms for just about every single word so you could sound more sophisticated? Truth: I’ve thesaurusized (yep, I’m making up words now) a good majority of this blog post. Many of us are still slaves to that instinct — to use more complex words and phrases just to sound smarter, regardless of the audience we’re talking to. Storytelling 101: Know your audience. Most of our audiences won’t think we’re smarter because our words are biggerer. Ok, c’mon. How awesome is that title? That study showed that expressing familiar ideas in complex language is actually taken as a sign of POOR INTELLIGENCE. Using overly embellished wording can also degrade your perceived credibility. 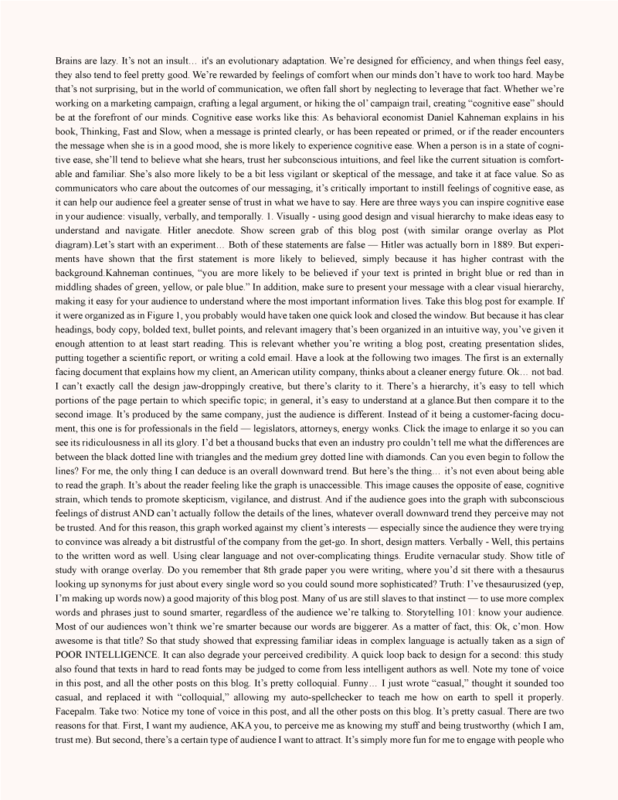 >>> A quick loop back to design for a second: this study also found that texts in hard to read fonts may be judged to come from less intelligent authors. Spoiler alert: there’s a plot twist at the end of the post related to this. Notice my tone of voice in this post, and all the other posts on this blog. It’s pretty casual. There are two reasons for that. First, I want my audience, AKA you, to perceive me as knowing my stuff and being trustworthy. But second, there’s a certain type of audience I want to attract. It’s simply more fun for me to engage with people who aren’t too stuffy and who are willing to put their real selves out there. After all, I’m a storyteller, and openness is central to being able to get to know someone well enough to tell their story in a way that’s true to them. In short, keep it simple. The order in which information is presented can be just as important as the information itself. The next time you’re at a party, queue up your best joke. But here’s the kicker: I want you to lead with the punchline. That’s right — open the joke with the ending and then go into the build up. Watch as your friends’ eyes glaze over… or as they gape at you in bewilderment. Either way, it’s time for you to get another cheese cube cuz the joke’s on you. Order matters, and it’s no different in business contexts. We now know, largely thanks to Kahneman and his contributions to behavioral economics, that human beings tend to make decisions primarily with the emotional parts of their brains. The subconscious mind makes the call, and the more rational, conscious mind swoops in to rationalize the decision as congruent with its beliefs. Knowing this, we have an opportunity to tell stories that tap into the brain’s emotional centers, leading people to precisely the decision we want their rational mind to think it made. In other words, storytelling can trick the conscious, rational mind into thinking it made a decision that, in reality, was made by the subconscious. These decisions tend to feel cognitively easy, like they came straight from the gut, and therefore, they feel right. So what order should I present my information in to be most effective? What you see here is a diagram of what’s called three-act structure. The x-axis represents the passage of time, while the y-axis represents emotional arousal. This is one of the most popular story arcs in Hollywood, and has been used in business contexts… very little actually. Despite it proving itself as a supremely effective tool for promoting audience engagement, virtually no corporate video campaigns, blog posts, grant proposals, legal arguments, or presentation decks take advantage of this structure. It’s a huge opportunity left on the table. In a nutshell, every good story should have a question and an answer. Will Matt Damon ever be able to return home from Mars? Will Julia Roberts get justice for a poisoned community? It’s the suspense between the question and answer that keeps us engaged. But all too often, companies give away the answer too soon. Sometimes they reverse the order and give away the answer before the question is posed. But most frequently, the answer is supplied without a question EVER being asked. A story full of solutions doesn’t accomplish much if there isn’t any uncertainty presented first. It goes unnoticed. Unfinished. People bail on stories midway through because all the good stuff was given away up front and the rest is just filler. Stories like this are also exceedingly predictable. And you know what it’s like to watch a movie where you know exactly where the plot is going within the first 10 minutes. We forget those stories like that. But if you swing the pendulum too far in the opposite direction, you may encounter a different problem. A story that’s peppered with information in a completely random order may initially stimulate some engagement by generating curiosity in the audience, but that’s likely to be lost quickly if the order is too hard to follow. Remember, cognitive strain is the enemy. A thoughtfully structured message with a question that eventually gets answered, is one that is far more likely to engage your audience. It’s more likely to produce those feelings of comfort, familiarity, and clarity that lead to cognitive ease. Just make sure to give the story time between the question and answer for the audience to develop a healthy sense of curiosity. Don’t answer the question immediately after it’s posed. Make them suffer a little. In short, every great story needs a wisely built plot. The great thing about cognitive ease is that it can be fostered simply by paying more attention to how a message is organized. Repeated exposure to ideas (or to a brand) will also, subconsciously, create a sense familiarity and comfort that tends to engender feelings of trust. This is a big reason why people have blogs in the first place: partly to share ideas that empower others, and partly to create a sense of familiarity and trust with their brand. It’s why billboard sales remain plentiful. But there’s a catch. It turns out that cognitive ease is a bit of a double edged sword. While it’s an exceptional device for making a message feel trustworthy, sometimes if a message is too easy to process, it becomes harder to remember. We sort of gloss over it without fully committing it to memory. Take, for example, the innovation of Sans Forgetica — a font designed specifically to improve retention (and recall) of written information. It’s hard to read, and that’s the point. By forcing the reader to feel more cognitive strain by inducing what psychologists call “desirable difficulty,” you dial in the reader’s capacity to commit the information to memory. Ok, but based on everything we talked about above, does this make the message feel less trustworthy? As storytellers, do we have to choose whether a message is trusted OR remembered? Can’t we have both? Yes, we can. We just have to consider the contexts in which our messages are being communicated. Would I use Sans Forgetica as the main type face on my company website? Heck no. That would only scare off people whom I haven’t built a relationship with yet. But would I use it in an educational setting where I may want my grad students to remember a specific slide after I’ve already built trust with them? You bet I would. And just because a message feels cognitively easy, doesn’t necessarily mean it’ll be less memorable either. On the contrary, a message that’s been structured with an emotionally compelling plot will absolutely be more likely remembered. That’s how memory consolidation tends to work — the more emotional an event, the more likely it is to be remembered — though it’s important to be mindful that different emotions contribute to memory in different ways. What excites me about all this is the idea that storytelling isn’t just limited to the retelling of events. It’s a scientific and artistic method for communication that, when leveraged well, can move people to meaningful action. I see it as a vehicle for important information; and it’s one of the most efficient ones out there for making a difference. 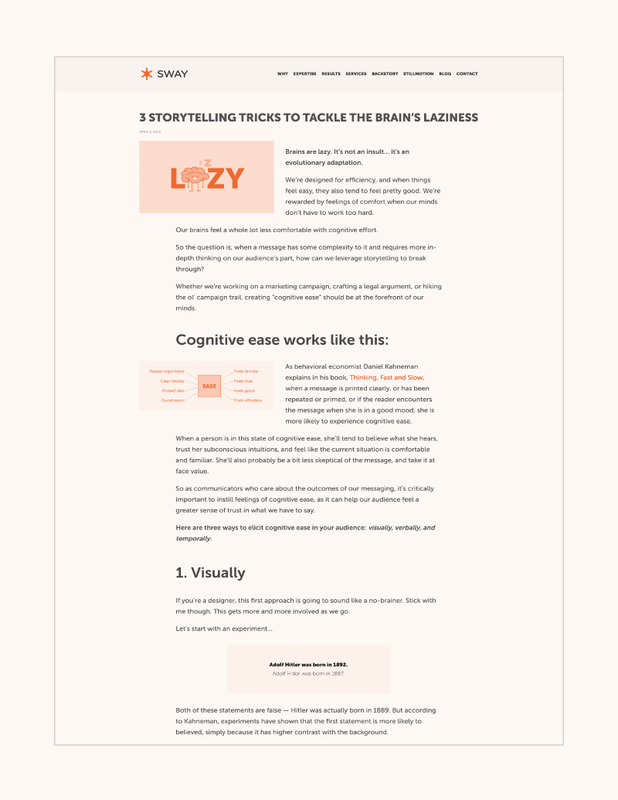 Update: Three days days after publishing this article, I found a study that seemingly contradicted what I wrote about cognitive ease and storytelling. The study is called "Story Spoilers Don't Spoil Stories" and it suggests some things about suspense that are pretty much opposite to what I said above. So which argument is true? Read my follow-up to find out. Does this contradict my last blog post?